Joseph Ingrassia delivers for Valhalla on Wednesday. 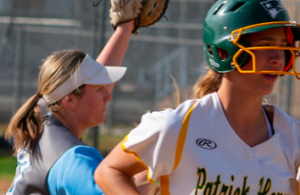 SPRING VALLEY (4-11-2019) – Nothing seems to come easy for the Mount Miguel Matadors. But learning how to close out ballgames, they keep inching their way up the CIF Division V ladder to a possible playoff berth. 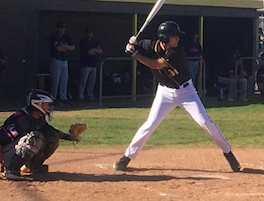 The Matadors’ third win over league rivals already this season in the Grossmont Valley League has risen expectations, especially after stopping crosstown rival Monte Vista, 6-4, Wednesday (Apr. 10). The Matadors collected five runs on five hits in the first two innings, then needed to stall a late Monarchs rally to move into position to sweep a season series against their neighbors for the first time since 2014. Third baseman Erik Kelly opened the scoring with a two-out double in the 1st, scoring Austin Ortiz (hit-by-pitch). His lead double and run in the 6th proved important when Monte Vista scored three times in the home-half of the frame. 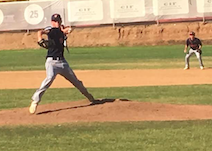 However, Thomas Ringer entered in relief to register the final four outs — all on strikes to more-than-slam the door shut and give the victory to starter Nico Camacho, who registered seven Ks in 5.2 innings. For Mount Miguel (5-11 overall, 3-2 GVL, catcher Beauzec recorded two RBI, while Camacho and Ringer both went 3-for-3 with a run scored. “We are playing with a lot of confidence right now,” Mount Miguel head coach Frank Coit said. “Our boys now hit the field expecting to win instead of hoping to win. Monte Vista (10-9, 2-5 league) received RBI singles from right fielder Aaron Zuniga and second baseman David Vega in the 6th. In addition, Jacob Savoy finished with two RBI. 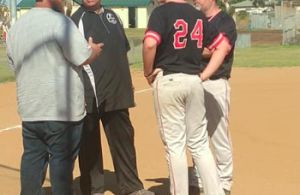 “My young guys are learning how hard you have to compete to win league games,” Monte Vista head coach Craig Neu said. “The teams in our conference are so competitive that little mistakes are the difference in ball games. El Capitan senior Wes Buckner at the plate on Wednesday. VALHALLA 4, EL CAPITAN 1 (8 inn. ): At Hostetler Field in Lakeside, in a tie-breaker game of sorts to see who will catch idle Steele Canyon for first place in the Grossmont Valley League, it was the visiting Norsemen who fought off the rust of 12 days off with three runs in the 8th inning to edge the Vaqueros. Kyle Casper, who started the ballgame with a leadoff homer, belted an RBI double to ignite the 3-run rally in the 8th, which was aided by a pair of El Capitan errors to make all three runs unearned. Valhalla (12-4 overall, 4-1 GVL) then called upon Andy Boyd to pitch the bottom half of the 8th, registering a 1-2-3 inning on a pop fly and a pair of shallow fly balls for the save. Norsemen starter Riley O’Sullivan only lasted three innings, so the victory went to Joseph Ingrassia, who tossed four innings f 3-hit ball. He struck out five and allowed an unearned run. Hard-luck El Capitan losing pitcher Connor Crist was pulled after 7.1 frames due to pitch count. He struck out eight Norsemen. Kasper’s home run looked like it would stand up until El Cap’s Rene Ponce reached on an error to open the 7th. He eventually scored on a sacrifice fly by Crist. For El Capitan (6-10 overall, 3-2 GVL), center fielder Charles Rodriguez had two of the team’s five base hits. WEST HILLS 21, EL CAJON VALLEY 1: At western Santee, Wolf Pack catcher Andrew Ritayik marked his return to the batting order following a collision at home plate back on March 23, by driving in four runs to down the visiting Braves in Wednesday’s (Apr. 10) Grossmont Valley League game. “It was pretty much station-to-station after the first inning,” admitted Ritayik, as West Hills led 6-0, with the margin climbing to 15-0 through three frames. The junior missed four games following a collision against Monte Vista, although the baserunner was not ejected. Still, Ritayik held on to the ball to register the out. Although Ritayik returned to catch, he had trouble tracking a ball as a batter. However, upon his return against the Braves, Ritayik batted 2-for-4 including an RBI double in the 2nd. He also scored four times. Meanwhile, a quartet of West Hills pitchers — starter Peyton Honick, and relievers Josh Gaylord, Joe Thrailkill and Ryder Diebold — combined on a 2-hitter with 10 strikeouts. For the Pack (5-12 overall, 4-3 GVL), right fielder Parker Craft and second baseman Tommy “T-Mac” McCormick each recorded two RBI. 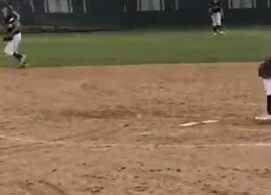 ECVHS (2-11-1, 0-6 league) scored its run in the 4th when the first three batters reached base. Greg Sanchez was hit by a pitch followed by base hits from Aaron Rodriguez and cleanup batter Samuel Barraza (RBI).